The Zulu King was issued with an ultimatum he could neither read nor understand. And while he was getting it translated, the redcoats invaded. "First comes the trader, then the missionary, then the red soldier." 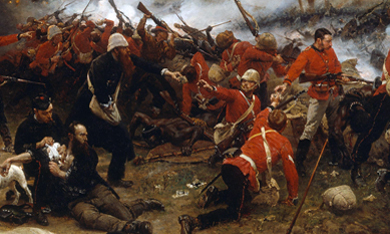 Most of us know the story of the heroic defence of Rorke’s Drift but just why were so many Victoria Crosses awarded for the action? Could it have been a public relations exercise to detract from the largest defeat every inflicted on a modern army by a native force? Tony’s role here as a grizzled sergeant who fought in both battles recounts the full story with drama, passion and humour. The main problem was that bullets run out and spears don’t! 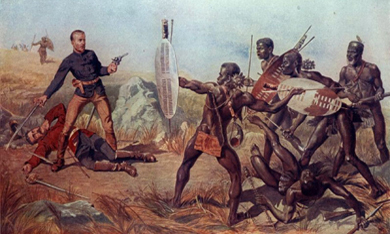 Around 150 troops from Britain and the colonies defended the garrison effectively against an onslaught from up to 4,000 Zulu warriors. But from the defeat came eventual victory in South Africa and Tony reveals it was all about the sparkling rocks in the ground at Kimberley.